On a random weekend this Fall we had a surprise visit from a couple of friends from GT CCF - Kara and Eddie! They were passing through on a 2-week trip to China and we were fortunate to be the first stop. Marisa and I had been planning on doing some new touristy things in Hong Kong this year, so the timing was perfect. On a beautiful Saturday we hit up the 10,000 Buddhas Monastery as well as the Bruce Lee Exhibit. 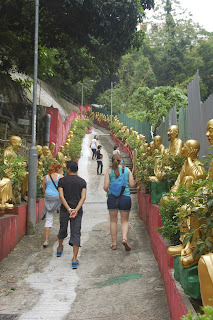 The 10,000 Buddha Monastery is situated in Sha Tin at the top of a small mountain - as most Buddhist sites are. It's an interesting place with a driveway lined on both sides with uniquely sculpted, golden buddhas. While we didn't count them up on our way in, we later read that there are actually close to 10,000 buddhas on the premises. Once you make it up to the top you are rewarded with a nice view, plenty of incense, big statues, and lots of greenery. If you're looking to spend a day in Kowloon, I think that this place could be coupled with a trip to the Nan Lian gardens since they aren't too far apart. It takes a little effort to find the pathway, but once you're there…….there's only one way to go. Up this crazy long hill. Don't worry though, there are tons of buddhas to keep you entertained on your pilgrimage. Each one is very unique, so it's hard to pick a favorite. It's interesting, however, that the eyes, eyebrows and lips are all in full color. The Sound of Music Buddha was probably the most memorable. Upon arrival at the top you are met with the largest buddha, marvelling at his splendor. 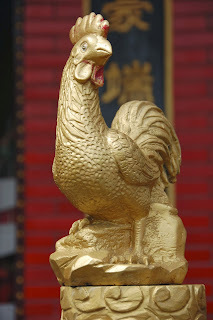 My birth animal - I missed the year of the Dog by one day! Marisa's birth animal - she would prefer just about anything else I think. So if the legs need a bit of exercise and it's a nice enough day then I recommend the short hike up to the top of the 10,000 Buddhas Monastery.